I guess that it is about time the friends of Israel in Western politics started to fully comprehend their role in our Judified universe -- AIPAC and the Conservatives’ Friends of Israel do indeed, have a crucial function : They are there to ‘help’ our politicians grasp why they ‘were created’. The senior Rabbi provides us with a devastating glimpse into the Judaic alienation from these aspects of the human condition and human experience. In an unequivocal manner, Rabbi Yosef depicts a clear dichotomy: Jews are the master race and the Goyim are nothing but a work force. The Goyim are there to sweat and struggle while the Jew is ‘sitting’ and ‘eating’. I guess that Rabbi Yossef has managed, in just a few words, to portray the intrinsic relationships between Judaism and Capitalism. But in fact, Rabbi Yossef didn’t invent anything new here -- his Saturday sermon sounds familiar enough to me. 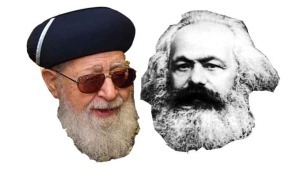 Karl Marx in his paper On The Jewish Question, identified aspects of Jewish ideology at the heart of Capitalism: “It is mankind (both Christians and Jews) that needs to emancipate itself from Judaism” Marx wrote. However, being a humanist, Marx wanted to believe that mankind (Jews and others) could overcome this tendency. Many early Zionists too, were also convinced that in Zion, Jews would liberate themselves and eventually become a nation like other nations,through productivity and labour.